How to apply the Multisensory Space Method? The Multisensory Space can be modified to meet the needs of different communities, associations, schools, libraries, both groups and individuals. The process of creating a Multisensory Space begins when a group of people decide to create a specific Space. First the group decides the topic and goals for the process. They discuss their thoughts and feelings related to it and what they want to achieve with it. The process continues by visualizing together the Space. After this visualization phase, the group begins to work on the Space itself by gathering the materials. When the Space is completed, it can be used for different kinds of activities, such as reminiscence, studying, encounters between different people and so on. The actual realisation of the Space can vary according to the needs of the group building the Space. Sometimes it is possible that the visualization process and planning of the Space turns out to be the most important part of the whole process for the individuals working on it. During this phase, the Space (which does not exist yet physically) can act for example as a method for reminiscence work, as a means to gather together some of the group’s traditions and memories. On the other hand, sometimes the planning and building of the Space can be done quite quickly, and the active part begins when the physical Space is ready and the people can use the space for encounters, reminiscence etc. Meetings of the planning group to discuss the topic and the goals of the process, as well as to plan the Space together. Collecting the material the group has decided to include in the Space and building the actual Space together. The building process empowers the individuals connected to the process and serves as a means for learning. It can promote a sense of togetherness between different people and communities. Building of the Space concretises abstract matters and makes them easier to process e.g. the meaning of different habits and cultural practices. It serves as a way to discuss identities and values and to share memories. In the finished Spaces, it is possible to present for example different cultures and ways of living. The environment can reinforce personal experiences and memories or help others in visualising the shared aspects of life. Although the word “group” has been used in this context, the Space can even be created individually. Usually, though, the groups creating the Spaces include about 2–8 persons. It is good to have at least two persons working on a Space, so that there can be interaction between them during the planning and building process. On the other hand, for a big group, it can be challenging to create a Space that represents equally every individual’s ideas and thoughts. The completed environment can act, for example, as a Somalian living room for multicultural encounters, a Parisian café for language studies or as an old Finnish sauna for reminiscence work. Common to all the different kinds of Spaces is that they should act as a relaxing and comfortable environment, which encourages interaction and communication between individuals who visit the Space. The Space is not supposed to be an exact copy of some particular real-life environment. It is sensible to pay attention to the way in which the completed Space will be used. 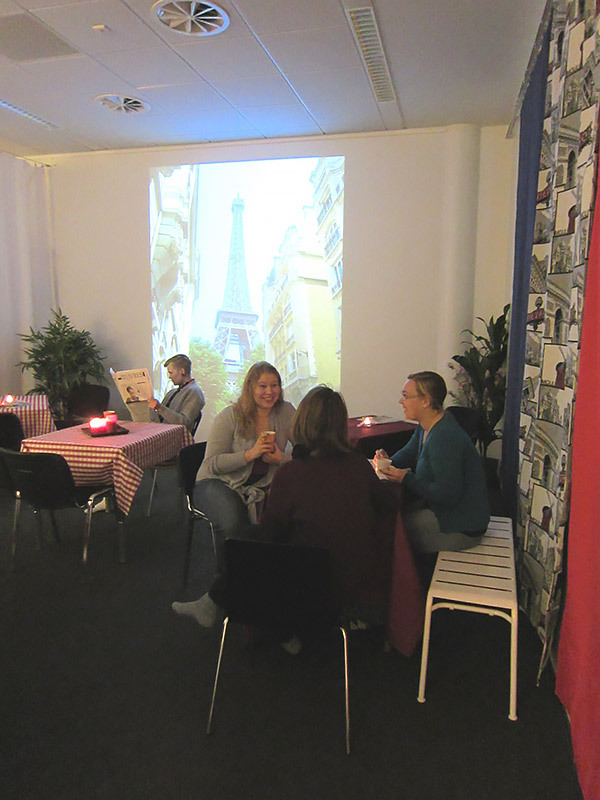 For example, in a Parisian language café it is important to create an atmosphere that encourages people to use the language of that culture with different people, and in a Somalian living room, the Space should enable encounters between different kinds of people in an environment that feels both inspiring and cosy.